Chimpanzees are great apes of the genus Pan. They live in Africa. 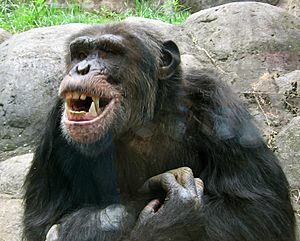 The behaviour described in this section refers to the common chimpanzee. 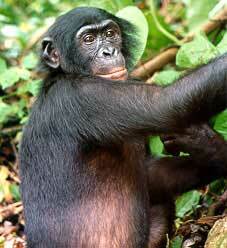 At present there is no evidence that the bonobo has a similar level of aggressive behaviour. 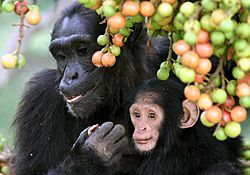 If they can, male chimpanzees try to kill the male members of neighbouring groups. Males work together when they spot a chance to make a lightning raid on an isolated male from the other group. They kill him. In Gombe, Tanzania, a group in the 1970s was seen to kill seven of their neighbours one by one, until all were gone. It can take years for this to happen but, when it does, the remaining females and the neighbouring territory are added to the now larger group. Attacks like this are carefully planned, done only when success is likely, and carried out in silence. Chimpanzee Facts for Kids. Kiddle Encyclopedia.